On the base of every handle that Sunset Hill Stoneware makes for its stoneware coffee mugs and beer steins, you'll find a thumbprint where our artisans have attached that piece. The Sunset Hill Stoneware employees leaving these thumbprints also apply the medallions to your unique mugs. One of the people hand-applying your handles and medallions is our own Elena Chevalier. Elena has worked in our handle and medallion application department for almost two years. 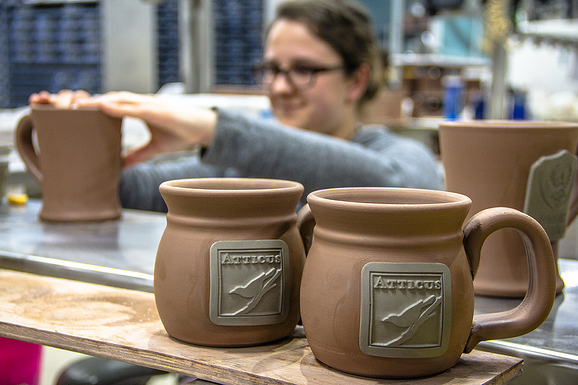 She's all too familiar with the work that goes into handcrafting your mugs and making them like no other. When Elena first joined the Sunset Hill Stoneware team, she applied medallions full-time. However, she has since begun applying handles to your unique coffee mugs as well. She and her coworkers at the handle and medallion station switch duties regularly as a form of cross-training and to help us make mugs faster than anyone else. Thanks to some of Sunset Hill Stoneware's in-house technology, Elena can easily reference where the medallion needs to be placed on each mug. Intuition is also involved, to some extent. "You have to figure out if it's going to touch the lip (of the drinker)," Elena said. As a rule of thumb (pun fully intended), Elena always places the medallions one thumb's width down from the lip of the mug. However, she had to develop this knack for knowing where to place the medallion over time. She said it took her about a month of applying medallions to get the hang of the process. "Now, I can just zoom through it and I don't really have to look at the screen anymore except to know which medallion it is," Elena said. "Then, you just run on autopilot." Alongside her coworkers, Elena applies medallions to hundreds of mugs each day. That translates to thousands of mugs each week with her craftsmanship. Not all mug handles are created equal. Many are longer or shorter depending on the mug style, and the handles on our steins are noticeably longer across the board. Every handle has to have a layer of slip, or clay mixed with water, applied to one end in order to secure it to the side of the mug. "You have to make sure it has a good application. Otherwise it'll just pop off later," Elena explained. However, that doesn't mean there isn't some level of individuality when applying the handles. 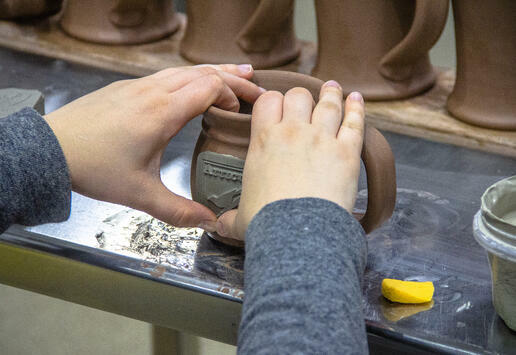 After working on the handles for several months, Elena began to notice that the mugs all had slightly different handles depending on who did a particular batch. "Everyone has their own different method of doing it," Elena said. "I can tell it's mine because it's smooth on the top, because I scoop up the rest of the slip that's left and squeeze it on the bottom of the base so it's kind of sharp." Some of her coworkers prefer to flatten the base of the handle for a smoother appearance, while others place the end of the handle near the very bottom of the mug, among other variations. Regardless of the placement style, Elena says they all form their handles into a letter "C" shape to make them more ergonomic than traditional mugs. Having studied fine art in college, Elena is all too familiar with how dirty and dangerous working with ceramics and pottery can be. Pottery studios aren't known for their cleanliness, with splattered and dried clay coating practically every surface. "Back at school, you'd walk outside and you'd be trailing dust everywhere," Elena explained. "That can really get you sick, especially with glazing." Lung diseases like cancer and silicosis are common in the pottery industry. Many potteries require their employees to use respirators and masks to prevent illness, but with long-term exposure it's still risky. Sunset Hill Stoneware's employees don't have to though, thanks to special technology we use to trap dust before it becomes airborne. 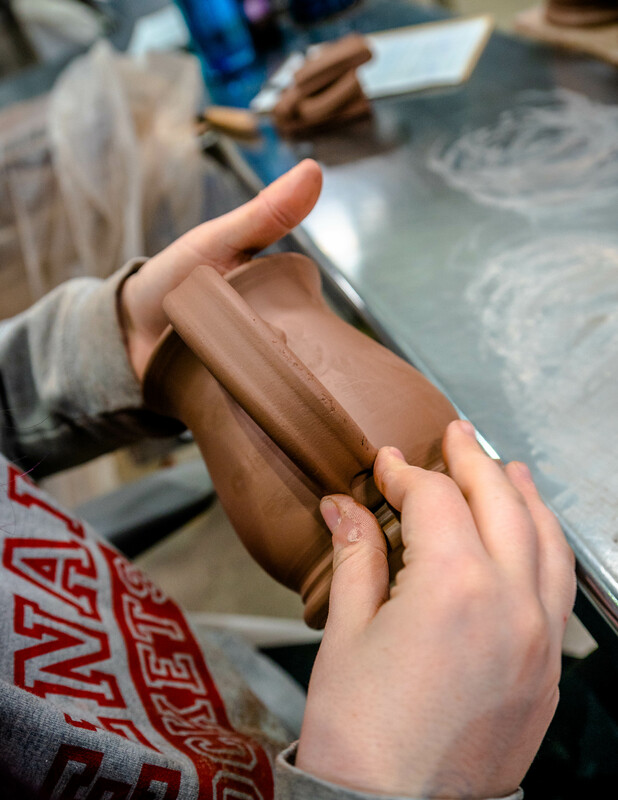 Having worked in a pottery studio while getting her bachelor's degree, she also appreciates just how clean Sunset Hill Stoneware's production facility is. She was surprised when she first started at the level of technology Sunset Hill Stoneware married to a very traditional craft, and that nobody has to wear dust masks because there is no dust. Another factor is the responsibility each person at the shop takes during cleanup. Before the end of the day every day, Elena and her coworkers have to make sure that their stations are clean and completely free of leftover clay and that their equipment is clean. Otherwise,the clay will dry into a very fine dust that causes problems both for her and her coworkers, and for our unique mugs. "If there's dried up clay on your station, then it'll just stick to the bottom of the mug and really scratch it up," Elena said. Elena's artistic streak extends beyond working hours though. In her free time, she's an accomplished oil painter with a degree in fine art from University of Wisconsin-Oshkosh. 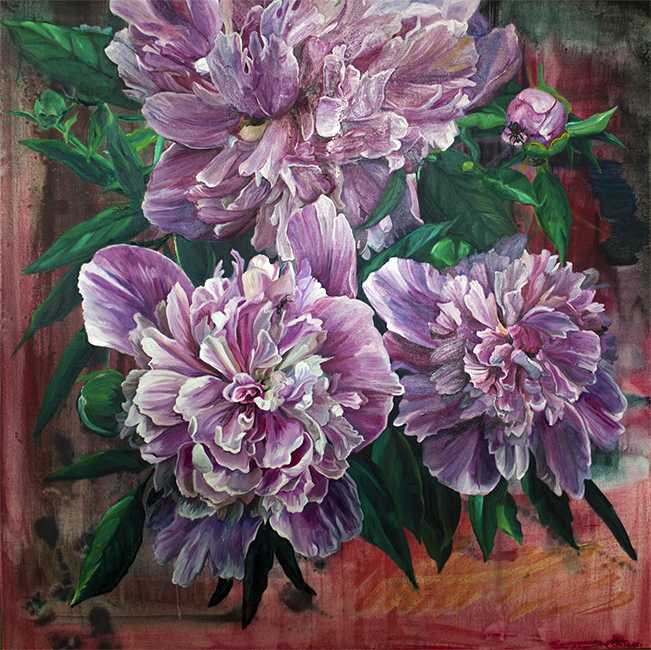 However, her favorite subjects to paint include plants, mushrooms and other lifeforms with small, intricate details. Frequently, her search for these organisms takes her into the outdoors, where she'll forage while hiking and camping. "Being outside is really a meditative experience," she said. "You kind of lose yourself. "I'm always looking at the ground for something that'll draw my eye," Elena explained. "I've learned to appreciate the smaller things. There's so much that you can find and use." One of Elena's favorite finds was a patch of orange, fluted chanterelle mushrooms she found on a ridge in the Upper Peninsula of Michigan. After taking photos of the mushrooms and questioning whether they were delicious chanterelles or similar-looking but very poisonous jack o'lantern mushrooms, Elena's cousin ate them to find out. Fortunately, he was fine. The mushrooms really were chanterelles. 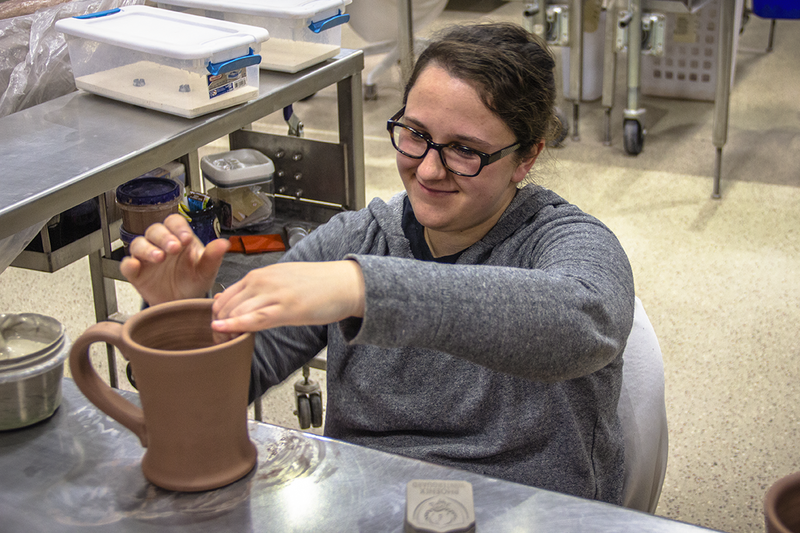 In addition to her painting endeavors, Elena also has two cats and is thinking about applying to graduate school so she can learn more about pottery and her craft. She has her own website where anyone can view her collections of oil paintings, including past exhibitions where her work has been featured.